What is an OWL Yagi? 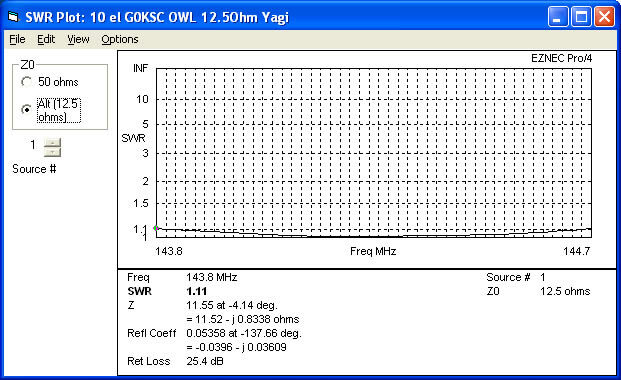 An OWL (Optimised Wideband Low Impedance) Yagi is one which has been developed away from the usual narrow-band characteristics normally associated with low impedance antennas. I spent a considerable amount of time pushing the optimisation tools I have in order to produce low impedance antennas that capture the best characteristics of both low impedance and OWA (Optimised Wideband Array (50 Ohm)) Yagi types. What is different about the OWL? The OWL is very unique, it produces traditionally high gain and F/B (Front to back) properties of older low impedance designs while producing wide bandwidth and clean patterns too. What do these differences mean? First of all if an antenna has a wide and low SWR curve, it will be much more stable in wet conditions. Many hams that fall into the GAIN FIGURE TRAP of low impedance designs we see on the Internet today, find out the hard way all the disadvantages they posses once they build their chosen design. First of all, when building the antenna, if every measurement is not absolutely spot on, the constructor may find himself in a position where a good SWR can not be achieve in the band area he wanted. This can lead to many hours of checking and re-checking and perhaps even giving up. Next is wet weather performance. Rain, snow and ice, cause low impedance antennas (narrow band) to shift in frequency by such a margin, they become unusable. The OWL is different, because all G0KSC OWL Yagis are modeled with very wide and flat SWR curves, build tolerances are 'forgiving' should the constructor make a few small mistakes. The next is that of pattern. Over the last 20 years, Hams have become familiar (and accepted) the noisy antenna patterns produced in K6STI's Yagi Optimiser program. Many of the very familiar antenna designers use this and model antennas on default settings focusing only on absolute gain and nothing else. Maintaining pattern symmetry in both Elevation and Azimuth planes leads to a much better antenna with the ability to null out any unwanted signals from the sides, above and below the antenna. Additionally, if side lobes are at a wide angle and only 15dB down on the main lobe, these signals will be less than 2S points down on the desired signal. Some hams may consider this OK but if a neighbours plasma TV can be heard very loud on a 180 degree sweep, is this still OK? The OWL has sacrificed just a few .01's of a dB in forward gain to suppress these huge lobes to a much greater extent in both Elevation and Azimuth planes than any other low impedance Yagi and thus ensuring a much more acceptable user experience. This said, in most cases, the OWL produces better gain per metre than anything out there currently. If you want to read full details of how the OWL has been developed and all benefits, you will need to subscribe to DUBUS magazine. Within the OWL article (DUBUS 1 2010) I explore the various matching methods and settle upon the well tested DK7ZB coaxial stub as the least antenna impacting matching method and therefore, OWL designs come on both 12.5Ohm and 28Ohm in order to gain the benefits of 50 Ohm and 75 Ohm coaxial stub matching lines. However, the user should ensure that the highest quality coax is used for the stubs and tests should be carried out within the making of the stub to ensure the velocity factor of the coax is correct and as per the manufacturers specification, some are not. My own tests have proven that coax cable quality is very important within this matching arrangements. I recommend the use of Westflex103 (or similar) within 12.5Ohm versions and at least RG11A/U 75Ohm coax for the 28Ohm versions. These are both coax cables intended to be used within a transmitting environment. Satellite TV coax is not recommended and if the users chooses to use this type of coax, varied results may be seen. Also, it is important to use the manufacturers velocity figures as a guide only and tests should be carried out to confirm these figures. For example, Westflex 103 and Ecoflex are quoted at .85 Velocity factor. When I tested both cables, velocity factors of .83 and .82 were seen respectively. More on this within the 'Building the OWL match' section. Why should I chose an OWL Yagi? The OWL Yagis produce the highest levels of gain per metre of boom than any other G0KSC design. Although these differences are small in some cases it means class-leading G/T figures within the VE7BQH G/T lists (2M). 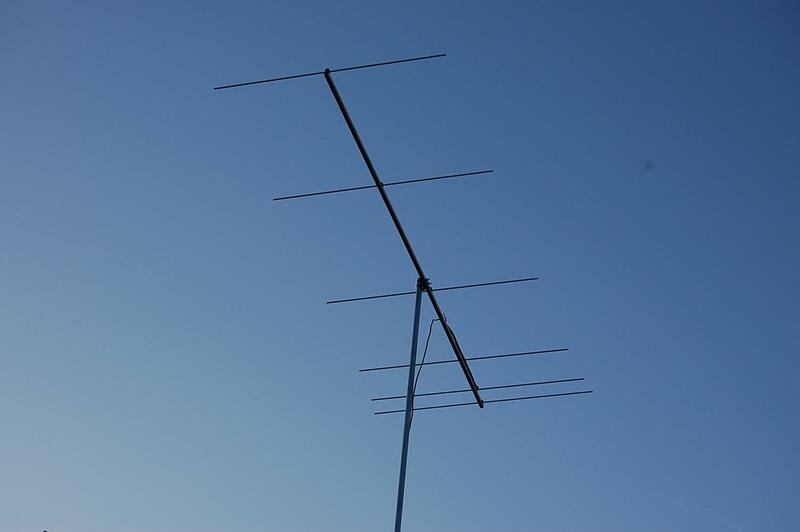 If you are in a very quite location, with very little man-made noise and wish to use the antenna for everything other than EME, the OWL maybe a good choice. However, the LFA is still the best low-noise example for EME. If you have any questions relating to the OWL Yagi, please Email me. I am happy to hear from everyone! If you build one, please send photos!